It has been a quiet year for H7N9 cases in Hong Kong - at least until now - as today we have the announcement of an imported case (a 60 y.o. male from Jiangsu) who was initially hospitalized in Hong Kong on the 12th - released 3 days later after testing negative for influenza - and was then rehospitalized a week later. The patient's son has also been admitted to the Hospital Authority Infectious Disease Centre (HAIDC) in Princess Margaret Hospital with a sore throat. This is the 14th imported H7N9 case to be detected in Hong Kong since the virus emerged in the spring of 2013, and the first detection this year. With more than 7 million residents crammed into just 426 sq miles, the CHP takes infectious disease threats very seriously. Today's discovery will set a major public health response into motion, including contact tracing and possible quarantines. 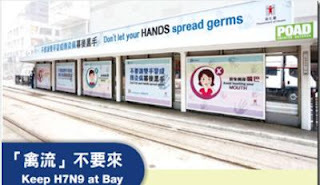 The Controller of the Centre for Health Protection (CHP) of the Department of Health (DH), Dr Leung Ting-hung, announced today (February 23) the investigation into the first imported human case of avian influenza A(H7N9) in Hong Kong this winter, and again urged the public to maintain strict personal, food and environmental hygiene both locally and during travel. "Due to the seasonal pattern, our risk assessment shows that the activity of avian influenza viruses is expected to remain at a high level in winter months. In view of this sporadic case, the public, particularly travellers and those who may visit the Mainland, should heighten vigilance. Do not visit poultry markets and farms. Avoid poultry contact," Dr Leung said at a briefing this evening. The male patient, aged 60 with good past health, lives and works in Suzhou, Jiangsu. He came to Hong Kong on February 5 and reported onset of fever, chills, rigor, cough and shortness of breath since February 8. He consulted a private doctor on February 10 and 11 who referred him to Pamela Youde Nethersole Eastern Hospital (PYNEH) for management on February 11. Upon admission and laboratory testing by PYNEH, his specimen collected on February 12 preliminarily tested negative for influenza A. He was discharged on February 15. Clinical diagnosis was pneumonia and he has been in stable condition all along. The man subsequently sought advice from another private doctor on February 18 and 22. Further testing by the CHP's Public Health Laboratory Services Branch on his specimens taken on February 12 returned a result that was today confirmed as being positive for avian influenza A(H7N9) virus. He has been admitted to the Hospital Authority Infectious Disease Centre (HAIDC) in Princess Margaret Hospital today for further management. The patient visited a wet market near his residence in Suzhou in which he reported no poultry contact. Initial enquiries revealed the patient's afebrile son with sore throat since February 22, who has also been admitted to the HAIDC for observation this evening. To date, his wife has remained asymptomatic while tracing of the patient's other close contacts in Hong Kong is ongoing. "The case will be notified to the World Health Organization and the National Health and Family Planning Commission. We are communicating with the Mainland health authority to follow up on the patient's exposure and movements in the Mainland. Based on information available thus far, it is classified as an imported case. Investigations are ongoing," Dr Leung said. Letters to doctors, hospitals, kindergartens, child care centres and primary and secondary schools as well as residential care homes for the elderly and the disabled will be issued to alert them to the latest situation. This is the 14th imported human case of avian influenza A(H7N9) confirmed in Hong Kong. Since March 2013 to date, 707 cases have been reported in the Mainland, while from October 2015, 50 have been reported.